Home to Britain's oldest nature reserve Wicken Fen, with it's wild ponies and diverse range of plants and animals, Cambridgeshire has more to offer than the historic Cambridge; There's Ely Cathedral, lively Peterborough and a great terrain for cycling. A lakeside lodge with spectacular views, a hot tub and use of the on-site indoor pool.. All on the ground floor. Dining area: With French doors leading to decked terrace. Bathroom: With shower over bath, and toilet.. Heating, electricity, bed linen and Wi-Fi included. Decked terrace with garden furniture. Indoor swimming pool, gym, sauna and steam room (shared with other properties on site, children permitted Mon-Fri 6.30am-6pm and Sat-Sun 10am-2pm). Hot tub (private). Private parking for 1 car. No smoking. Please note: This property has a security deposit of £40. There is a lake in the grounds.. Discover life in the Cambridgeshire countryside with a stay at the beautiful Tydd St Giles resort. Set in 150-acres of peaceful landscaped grounds, this collection of lodges makes a peaceful setting for a family break. With open plan designs and decked patios, the lodges have been designed with relaxation in mind, and each one has a chic décor throughout. For days that are all about staying close to home, you’ll find an indoor swimming pool, gym, sauna and steam room ready and waiting to welcome the weary… bliss. If you’re hoping to indulge those hobbies you just don’t get time to enjoy often enough, you can buy passes for lake fishing and the 18-hole golf course at the site’s reception, and what better way to forget the world for a while. For walkers, you’ll find some beautiful walks and nature trails around the lake, and the bird watching spots that dot it make the perfect spots to sit for a little while and just enjoy the sounds of the countryside. With all that country air you’ll more than likely find yourself with a hankering for a plate of something hearty, and the Stables Bar & Grill serves up fantastic food that reflects the flavours of the seasons...enjoy. Augusta is the kind of spacious, contemporary lodge that’s been designed to showcase its setting. Step into the open plan living, kitchen and dining space and take in the lakeside views that make this room a special place to unwind. Step from the living space and onto the decking that wraps its way around the lodge, and just imagine watching the sun set over a glass of something bubbly while you unwind in the hot tub. With uninterrupted views across the lake, Augusta makes a tranquil space to enjoy time together as a family and the many facilities that make the resort such a popular one. The indoor heated swimming pool means there’s always time for a dip, and the sauna and steam room wait to welcome the frazzled. You’ll find Tydd St Giles just a 15-minute drive from the historic town of Kings Lynn. Perfect for those of you keen to explore Norfolk or Cambridgeshire, the site’s the perfect base for shoppers, walkers and family adventures. Stylish and chic lodge, perfect for romantic getaways. Spacious king size double with doors leading to paved breakfast area. Open plan lounge/kitchen area with vaulted ceilings and stylish design. Undercover decking area to the front of the lodge with garden furniture and views of the golf course.. Peacefully tucked away amidst a glorious sweep of unspoilt Cambridgeshire countryside, this stunning collection of lodges offers the perfect rural getaway. A paradise for golfers and ideal for enjoying revitalising breaks or relaxed holidays with family and friends at any time of year. Designed and finished to truly exacting standards, each real-log lodge boasts a stylish, country-chic ambience to compliment their setting on the edge of an excellent 9-hole course.. Peacefully tucked away amidst a glorious sweep of unspoilt Cambridgeshire countryside, this stunning collection of lodges offers the perfect rural getaway. A paradise for golfers and ideal for enjoying revitalising breaks or relaxed holidays with family and friends at any time of year. This contemporary lodge includes use of the site’s indoor swimming pool, gym and eateries.. All on the ground floor. Living area: With electric flame-effect fire, TV, DVD player and French doors leading to decked terrace. Kitchen area: With electric oven, electric hob, microwave, fridge/freezer, dishwasher, washing machine and tumble dryer. Bathroom: With shower over bath, and toilet.. 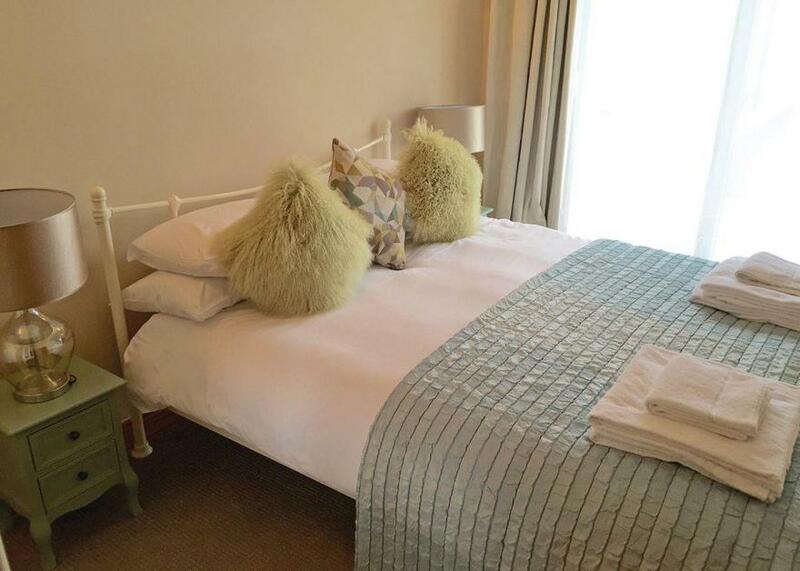 Heating, electricity, bed linen and Wi-Fi included. Cot and highchair. Decked terrace with garden furniture. Indoor swimming pool, gym, sauna and steam room (shared with other properties on site, children permitted Mon-Fri 6.30am-6pm and Sat-Sun 10am-2pm). Private parking for 1 car. No smoking. Please note: This property has a security deposit of £40. There is a lake in the grounds.. Discover life in the Cambridgeshire countryside with a stay at the beautiful Tydd St Giles resort. Set in 150-acres of peaceful landscaped grounds, this collection of lodges makes a peaceful setting for a family break. With open plan designs and decked patios, the lodges have been designed with relaxation in mind, and each one has a chic décor throughout. For days that are all about staying close to home, you’ll find an indoor swimming pool, gym, sauna and steam room ready and waiting to welcome the weary...bliss. 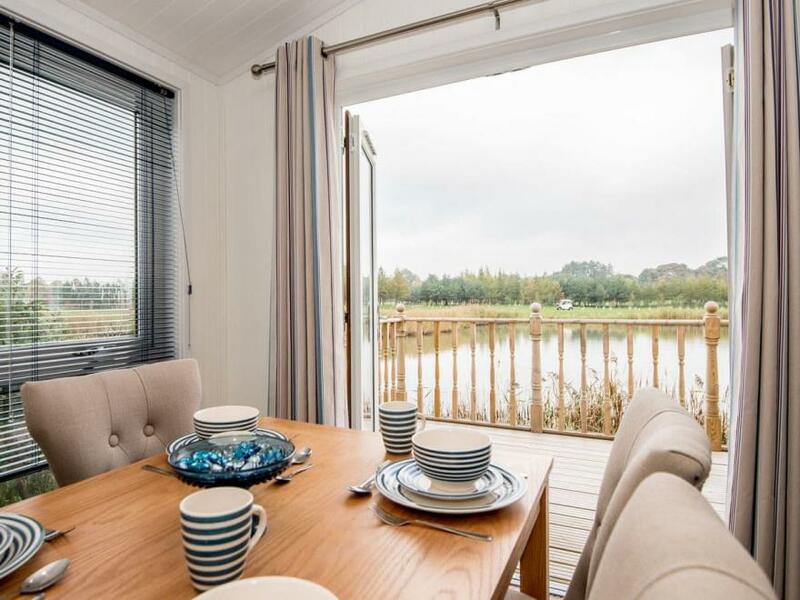 Carnoustie is a spacious, three bedroom lodge perfect for your escape to Cambridgeshire. The open plan living, kitchen and dining space makes a stylish area to relax in between adventures, and you can step out onto the decked terrace that wraps around the whole of the lodge. A peaceful spot to sit back and enjoy the views across the lake, the patio’s perfect for those outdoor meals with nothing but the sounds of the countryside. Back inside, you’ll find the master bedroom has everything you need to escape for some time out after a busy day. From the kingsize bed you won’t want to leave, to the en-suite shower room for that extra privacy, this is a space that’s all about forgetting the rest of the world. Set on the landscaped grounds of the Tydd St Giles resort near Wisbech, Carnoustie’s a popular choice with families. With the indoor swimming pool, gym, sauna and steam room, there’s plenty to keep you busy no matter what the weather decides to do. 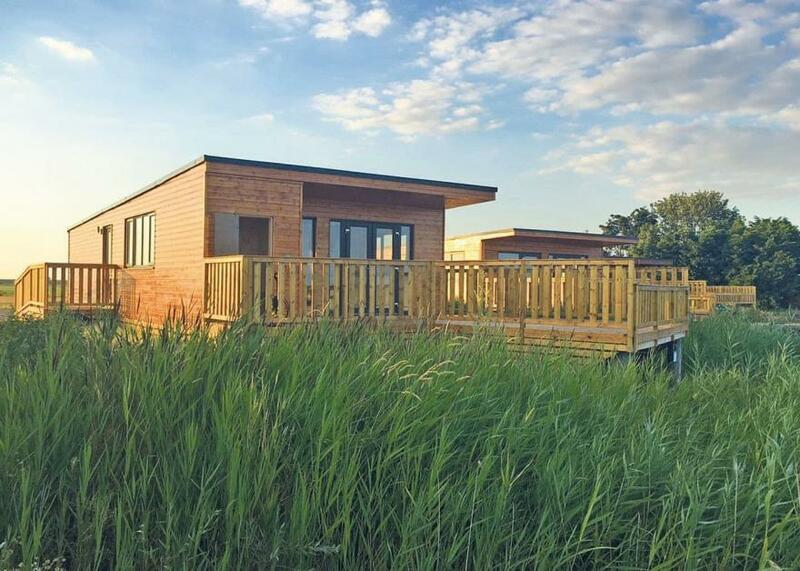 Comfortable and spacious lodge overlooking a lake with panoramic views of The Fens. One kingsize and one twin. The twin can be linked to form a kingsize on request. Shower. Additional sleeping for two in the lounge area. Open plan lounge/kitchen. 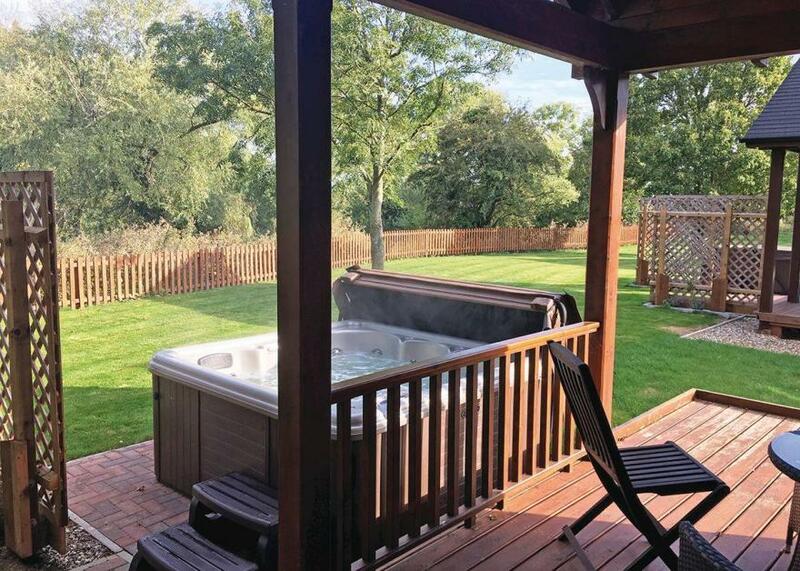 Doors leading to large decking area with outdoor hot tub.. Head Fen Country Retreat sits close to the borders of Cambridgeshire, Norfolk and Suffolk making it a great location to use as a base for exploring East Anglia. Head Fen Country Retreat is only 10 minutes from Ely, 30 minutes from Cambridge and an hour from Norwich so there’s always plenty to explore. 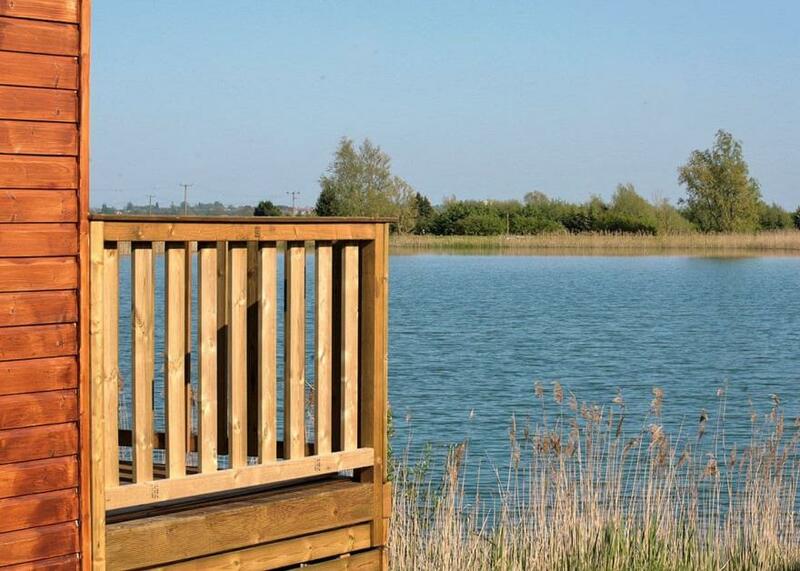 Particularly popular with lovers of the countryside, Head Fen Country Retreat has a private fishing lake with free fishing available for visitors, we’re just 10 minutes from Welney Wetlands Centre and we sit right on the Hereward Way long distant walking route. Sit in your hot tub while looking out to the large lake with the stunning fens surrounding you, on a good day you can even see Ely Cathedral. . Head Fen Country Retreat sits close to the borders of Cambridgeshire, Norfolk and Suffolk making it a great location to use as a base for exploring East Anglia. Head Fen Country Retreat is only 10 minutes from Ely, 30 minutes from Cambridge and an hour from Norwich so there’s always plenty to explore. Sit in your hot tub while looking out to the large lake with the stunning fens surrounding you, on a good day you can even see Ely Cathedral. . With fantastic amenities right on the doorstep including walking, bird watching, fishing and horse riding, Tydd St Giles Golf and Country Club offers the perfect hidden getaway in luxurious surroundings. 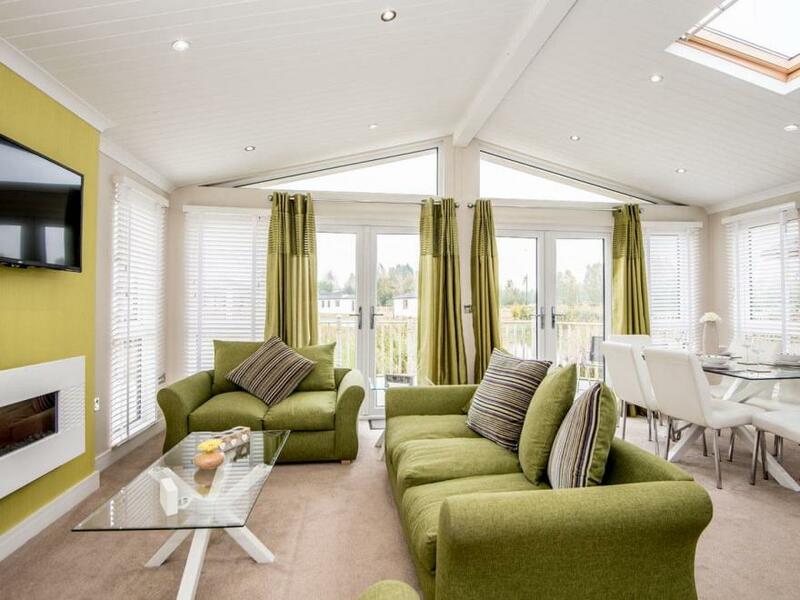 Comfortable and spacious lodge overlooking a lake with panoramic views of The Fens. One kingsize and one twin. The twin can be linked to form a kingsize on request. Shower. Additional sleeping for two in the lounge area. Open plan lounge/kitchen. Doors leading to large decking area. Sauna. No pets.. Head Fen Country Retreat sits close to the borders of Cambridgeshire, Norfolk and Suffolk making it a great location to use as a base for exploring East Anglia. Head Fen Country Retreat is only 10 minutes from Ely, 30 minutes from Cambridge and an hour from Norwich so there’s always plenty to explore. 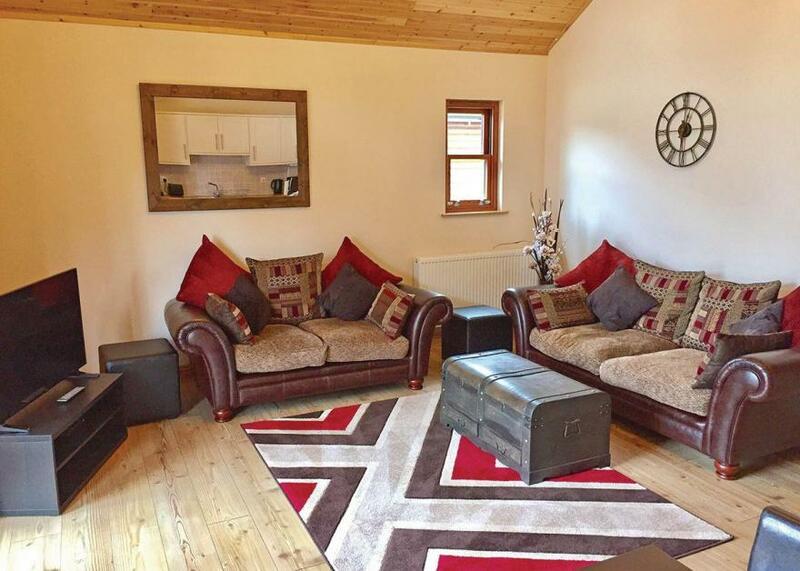 Modern yet rustic designed lodge, ideal for families or couples. One master king size double and one twin. Vaulted, spacious open plan lounge/kitchen area with patio doors leading to covered decking area with garden furniture. Outdoor hot tub. No pets.. Peacefully tucked away amidst a glorious sweep of unspoilt Cambridgeshire countryside, this stunning collection of lodges offers the perfect rural getaway. A paradise for golfers and ideal for enjoying revitalising breaks or relaxed holidays with family and friends at any time of year. 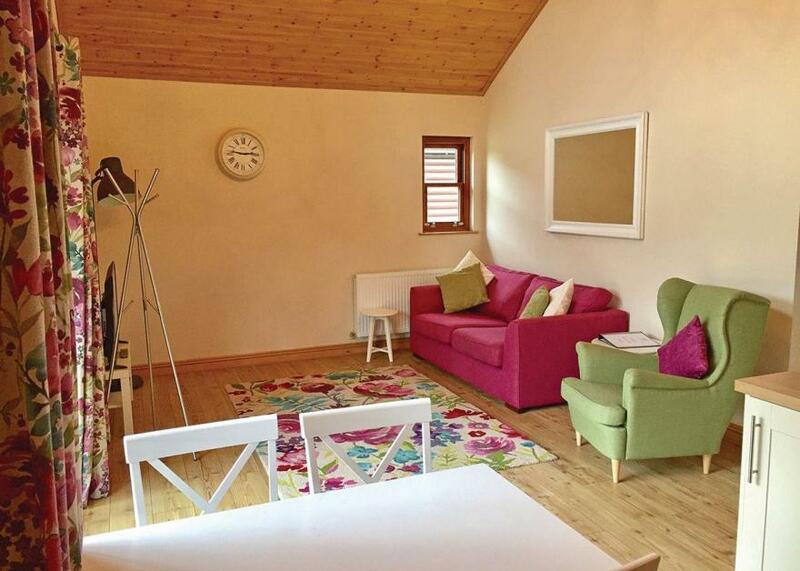 Modern yet rustic designed lodge, ideal for families or couples. One master king size double and one twin. 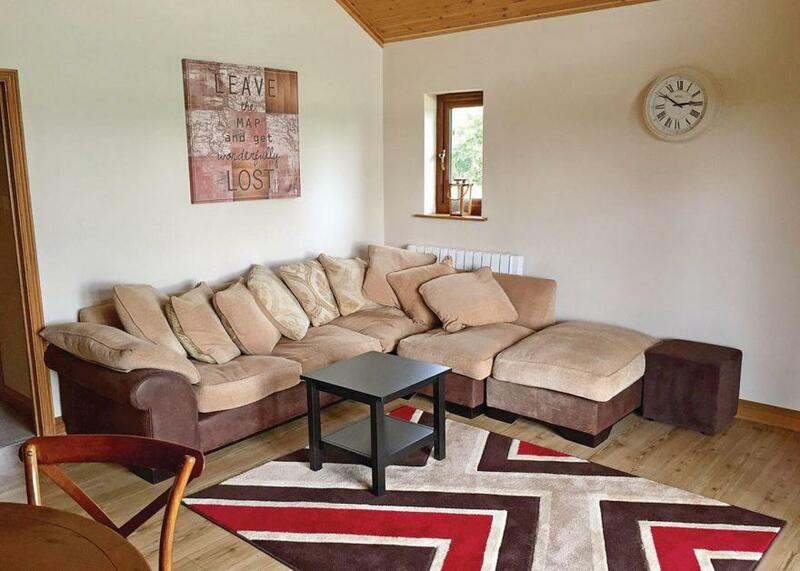 Vaulted, spacious open plan lounge/kitchen area with patio doors leading to covered decking area with garden furniture.. Peacefully tucked away amidst a glorious sweep of unspoilt Cambridgeshire countryside, this stunning collection of lodges offers the perfect rural getaway. A paradise for golfers and ideal for enjoying revitalising breaks or relaxed holidays with family and friends at any time of year. 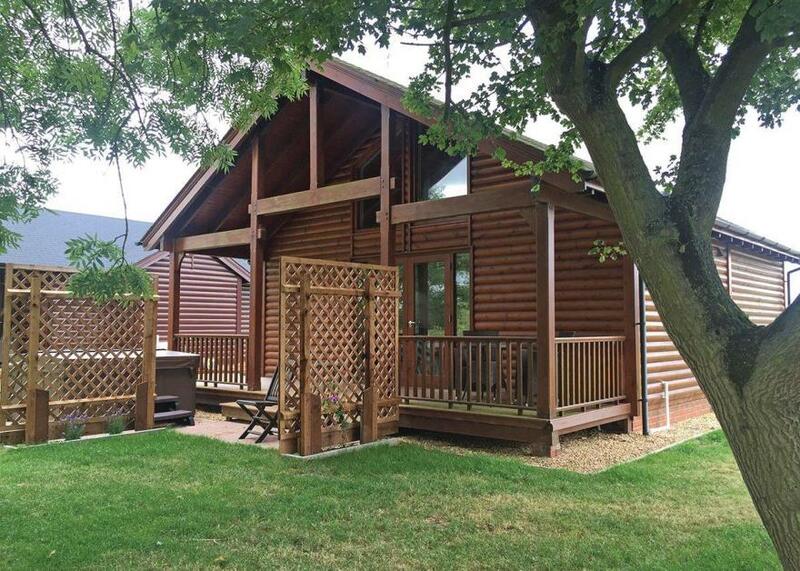 Modern yet rustic designed lodge, ideal for families or couples. One master king size double and one double. Vaulted, spacious open plan lounge/kitchen area with patio doors leading to covered decking area with garden furniture. Outdoor hot tub. No pets.. Peacefully tucked away amidst a glorious sweep of unspoilt Cambridgeshire countryside, this stunning collection of lodges offers the perfect rural getaway. A paradise for golfers and ideal for enjoying revitalising breaks or relaxed holidays with family and friends at any time of year. Stylish and chic lodge, perfect for romantic getaways. Spacious king size double with doors leading to paved breakfast area. Open plan lounge/kitchen area with vaulted ceilings and stylish design. Undercover decking area to the front of the lodge with garden furniture and views of the golf course. Outdoor hot tub. No pets.. Peacefully tucked away amidst a glorious sweep of unspoilt Cambridgeshire countryside, this stunning collection of lodges offers the perfect rural getaway. A paradise for golfers and ideal for enjoying revitalising breaks or relaxed holidays with family and friends at any time of year.